Jesus had led I SAW THE LIGHT MINISTRIES to proclaim in advance, the prophetic word that the Son of Perdition (the "antichrist") who is Bashar Assad, would appear in the sky in a fake coming of Jesus which would occur on March 1-2, 2018, and then later it was corrected to say April 1, 2018. You would immediately think that it was not fulfilled. But here I will present SOLID PROOF that it did occur and there are pictures to prove it! Although, the events of March 1-2 and April 1, 2018 are only foreshadowings of the actual true full fulfillment yet to occur in the near future in a much larger and more powerful appearance of the "antichrist" in Heaven, to be seen by millions or billions of people. We were looking for a FAKE Armageddon. We saw what the news called "Windmageddon"! That cannot be coincidence! Source. The news also called one of the major storms systems "The Beast from the East" (Source) which was the name of an old website that I used to read that also said that the antichrist Beast would be from the middle east and not Europe. We were looking for the manifestation of demons. We saw demons in the streets of Jerusalem! In the above picture of the men dressed like demons in the streets of Jerusalem on Purim, they was dressed as characters in the TV series & movie "Game of Thrones" which is about beings fighting for a throne. Thus, it's extremely easy to understand that it represented the demon, Assad, fighting for The Throne of GOD. It's totally impossible for this to be coincidence. This is MAJOR SOLID PROOF that the March 1-2 prophecy was fulfilled as a MAJOR foreshadowing of the future Strong Delusion, Abomination of Desolation. JESUS is proving the prophecies to the doubters & mockers, in order to give more time for them/you to believe and prepare! This is a very MAJOR direct threat against the USA! This was a historical event! As well as a Virginia Cedar Tree that stood watch over Washington’s tomb. Another prophetic/symbolic event foreshadowing the fall of America by the Assyrian storm of Assad, Russia & China. Purim March 1-2, 2018 was NOT an ordinary day! It was extremely prophetic. And you were told to watch it. And it's a very good thing that you were told to watch those dates! From all of the MANY things that happened on those dates, you should now know MORE than ever before, that the prophecies of JESUS WILL BE FULFILLED, regardless of dates & timing. The declarations about specifics were inaccurate. NOT False. ONLY inaccurate. And Purim March 1-2, 2018 symbolized and foreshadowed these soon coming events in huge ways! That CANNOT correctly be called "FALSE"! NO PERSON can honestly claim that NOTHING happened. The prophecy was NOT a complete failure. Therefore it cannot be called a "false prophecy". Only "not completely correct". NO PERSON can honestly claim that Feb. 17-18 and March 1-2 was never revealed to me. These dates were so extremely important. Now, more people all across the world have been made aware of the prophecies of JESUS! You can call me a "false prophet" all you want. I really don't care. I am very accustomed to it. But more importantly, now more people have been warned and made aware of the future fake coming of Jesus, and now it's been proven by both the bible and major foreshadowing events! That cannot be denied! Was the prophecy from JESUS or the devil? What was the fruit of the prophecy? 1. People got much more prepared for the time of greatest tribulation. 2. More people heard the warnings of true prophecies yet to be fulfilled. 3. Prophecies & doctrines were proven by the STRONG foreshadowings that occurred. The events of Purim 2018 proved that Assad WILL eventually appear in the sky. Some people might have doubted. But now, they should believe. Instead of having less faith in this ministry, everyone should have more faith than ever before. 4. Unbelievers & mockers were weeded out of the ministry, & out of our lives. 5. True believers were tried, tested and proven, while being made stronger. Those are GOOD fruits, not bad. Prophecy is NOT like a fast food restaurant, where you can order it exactly the way you want it, such as "extra tomato, no mustard, more mayonnaise than ketchup". In prophecy, it happens the way it's going to come, like it or not. It doesn't always occur the way that we think. But it still happened. March 1-2 was a true prophecy. I only declared it in incorrect words. And I confess that fault. And I repent of that fault. But nothing changes about the fact that the date was declared, and it was from JESUS, and it was fulfilled in the way that it was supposed to be fulfilled. We got it the way it was always supposed to be. But I released incorrect advertising of how it was supposed to be. Just like when a store says "Sale: $1.00", when it was always supposed to be on sale for $1.50. The company that owns the store (JESUS) always intended the sale to be $1.50. NOT $1.00. But the advertising company read the orders wrong and told the public that it was $1.00. It's a mistake. NOT a lie. There is a difference. I admit to being wrong about specifics. I confess and repent of that. But I'm not going to discredit GOD's warning shot by calling it a "false prophecy"! Purim 2018 was a fire drill (warning shot). To get us more prepared and test us. We needed to see how unprepared we were. We needed the rush in supplies and learning. Whenever there's no date, people don't do what they are supposed to be doing. But with a due date, people rush to accomplish the goal. We needed a practice fire to prepare us for the real fire. Sooner or later, the demon Assad will appear in the sky. It will NOT be a blue beam or any fake trick. He's a fallen angel who will be part of the Rev.12 war in Heaven. He will literally sit in the Seat of GOD in the Temple of GOD (in Heaven) as 2 Thes. 2 tells us. 30 days later Syria, Russia and Iran will invade Israel. At some point of time, Russia & China will invade the USA & Europe and other American allies. NO other international, worldwide ministry is declaring all of this. It's from JESUS. It's NOT from me. I'm only the mail/postal man. It's the prophecy of JESUS THE CHRIST, and it will occur. Period. Between March 2 and April 1, Jesus revealed to me that March 1-2 was NOT the true dates of Purim. The Jews were off by a month. There was a 13th month that they sometimes observe, but they did not observe in early 2018 but should have observed! Therefore the true date of Purim would be March 31-April 1. I then proclaimed the specific date of April 1 to be the date that the prophecies would be fulfilled to see Assad in the sky. And we absolutely DID SEE Assad or a powerful representation of him in the sky on that date, as well as the crashing of a Chinese space station, of which when its name is translated into English, it means "Heaven's Temple" or "Heaven's Throne"! Both events on the SAME date, the sighting of a fake Jesus in the sky, as was prodicted, AND the casting down from Heaven's Temple, as was predicted! Of course, both powerful foreshadowings of the yet to be fulfilled primary fulfillments. In the pictures above, you see the traditional image of Jesus that many people have on their walls and in statues. This is the traditional image of Jesus which is NOT the real appearance of Jesus. It is a FAKE Jesus. There is no such thing as a true or real picture of Jesus. There are no such real paintings, statues or images or drawings of the real Jesus. However, the bible does give us detailed descriptions of how He appears when mankind sees him in the sky or in Heaven. Dan. 8:9 (AOB) I BEHELD UNTIL THE THRONES WERE SET, AND THE ANCIENT OF DAYS (JE) SAT; AND HIS RAIMENT WAS WHITE AS SNOW, AND THE HAIR OF HIS HEAD, AS PURE WOOL: HIS THRONE WAS A FLAME OF FIRE, AND HIS WHEELS BURNING FIRE. Eze 1:26 (Vs. 27 in KJV) AND I SAW AS IT WERE THE RESEMBLANCE OF AMBER FROM THE APPEARANCE OF THE LOINS AND UPWARDS, AND FROM THE APPEARANCE OF THE LOINS AND UNDER I SAW AN APPEARANCE OF FIRE, AND THE BRIGHTNESS THEREOF ROUND ABOUT. :27 (Vs. 28) AS THE APPEARANCE OF THE BOW WHEN IT IS IN THE CLOUD IN DAYS OF RAIN, SO WAS THE FORM OF BRIGHTNESS ROUND ABOUT. Rev. 4:3 AND HE WHO WAS SITTING LIKE A JASPER STONE AND A SARDIUS IN APPEARANCE. AND A RAINBOW AROUND THE THRONE, LIKE AN EMERALD IN APPEARANCE. Rev 19:11 AND I SAW HEAVEN OPENED, AND BEHOLD, A WHITE HORSE, AND HE WHO SAT ON IT, CALLED FAITHFUL AND TRUE, AND IN RIGHTEOUSNESS HE JUDGES AND WAGES WAR. :12 HIS EYES A FLAME OF FIRE, AND ON HIS HEAD =MANY CROWNS; AND HE HAS A NAME WRITTEN WHICH NO ONE KNOWS EXCEPT HIMSELF. :13 CLOTHED WITH A ROBE DIPPED IN BLOOD, AND HIS TITLE IS CALLED THE WORD OF THE THEOS (Alpha & Omega). :14 AND THE ARMIES WHICH ARE IN HEAVEN [the Saints], CLOTHED IN FINE LINEN, WHITE, CLEAN, WERE FOLLOWING HIM ON WHITE HORSES. :15 FROM HIS MOUTH COMES A SHARP SWORD, SO THAT WITH IT HE MAY STRIKE DOWN THE NATIONS, AND HE WILL RULE THEM WITH A ROD OF IRON; AND HE TREADS THE WINE PRESS OF THE FIERCE WRATH OF THE THEOS (Alpha & Omega), THE ALMIGHTY. Therefore, the image that the Catholics saw on Easter (April Fools Day) April 1, 2018 (also date of true Purim) does NOT match the biblical description of Jesus, nor of his second coming. AND you were told in advance to watch for a FAKE appearance of Jesus in the sky to occur on that specific date! You were told in advance that it would NOT be the true Jesus. But that it would be the demon Assad. Although it was not the total fulfillment yet, it definitely was a partial and strong and powerful fulfillment. You might say that it was only clouds, and not Assad. But the fact that the date was declared in advance proves that it was NOT just clouds without any connection to demons. Plus you must consider that the image appeared to Catholics which are one of the main groups that worships Assad. And it was during their Easter worship. And Easter is an ancient Islamic holiday that began with the Assyrians. Easter worships "the antichrist" Assad. (Click for proof.) Plus, we must consider that the Chinese space station with the name of "Temple of Heaven" was cast down upon the Earth in the Pacific Ocean on the same date! The Philippines are located in the Pacific Ocean! For both events to occur on the same side of the world on the same date, the predicted date, proves that this was NOT just an illusion in the clouds AND also NOT the true GOD! It was a demon! It was Assad, as JESUS warned us! I don't understand how anyone who heard the prophecy in advance could think for even one second that it was the true GOD JESUS. You must remember that the bible tells us that Assad and the false prophets of "Pope" Benedict and Francis will work GREAT WONDERS that it could even fool the very elect if possible. Please do not be so easily fooled. It was April Fools Day. Remember that JESUS told us to expect a trick on that date. Do NOT fall for the April Fools trick. If you can so easily be fooled by this very weak image in the sky on April Fools Day, then how easily will you be fooled when the fullness of the prophecy happens when Assad will appear in the sky in a MUCH MORE powerful way. He will probably be seen on the very throne of GOD in Heaven! You can imagine the sky rolling back and being able to see into Heaven! Assad will not appear as Assad. He will appear very majestic with bright lights and in great glory. The bible tells us that he will display himself as being GOD. 2 Thes. 2. Please remember these things! I am VERY, VERY distressed that people in our congregation actually said that the appearance on April 1 was Jesus! I feel like pulling my hair out and ripping my shirt! If you can fall for such a weak delusion, how easily will you fall for THE STRONG DELUSION to yet appear?! If you thought for even one second that this could have been the true Jesus, PLEASE PLEASE FAST and beg Jesus to help you to not so easily be deceived and fooled and tricked! As we now approach the true date of Passover, this is extremely important. But even if it was not Passover, this is extremely important. Don't be fooled by magic or great wonders in the sky, or bleeding statues, or even by a resurrection of the dead. I have said it many times and I will say it again. I would NOT be surprised if Assad or the popes resurrect people from the dead. The bible warns us that they will do GREAT wonders. Don't be native and think that they cannot do such things. There are dead people being raised from the dead EVERY DAY in Africa by Babylonian magicians claiming to be doing the work of Jesus but operating in the power of Satan. Satan has power. Don't forget that! There are pictures to prove it! 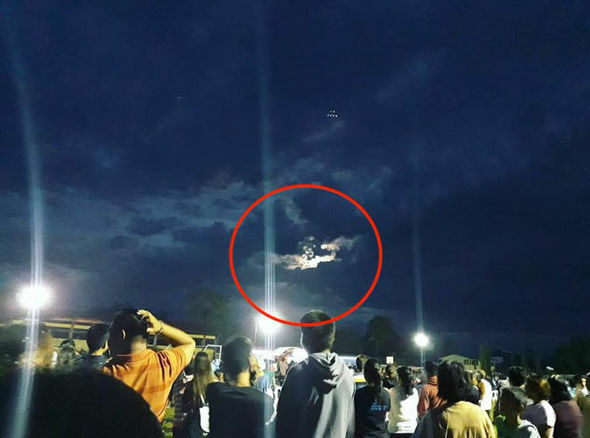 They did see a FAKE Jesus in the sky on the date of true Purim, Easter, April Fools Day of 2018! I Saw The Light Ministries had prophesied that there would be a false appearance of Jesus in the sky that would occur on April 1 Easter 2018. We thought that it would be Assad in the sky on that date. It was not Assad yet. But there definitely was a fake Jesus in the sky as had been prophesied. 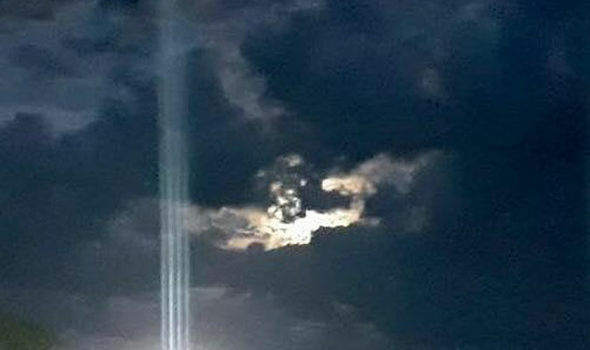 The occurrence was a strong foreshadowing of yet a larger and more powerful appearance of a fake Jesus in the sky yet to come. The Strong Delusion of 2 Thes.2, which is also the Abomination of Desolation of Matthew 24:15 and Daniel 12, will be the demon Son of Perdition, Assad, (called "Antichrist") sitting in the Seat of GOD in the Temple of GOD in Heaven, in a major fake coming of Jesus during the upcoming NATO direct attack against the Syrian president Bashar Assad, evil be his name. Also on the date of true Purim 2018, the Chinese space station named "Tiangong" was cast out of the heavens onto the Earth. It also foreshadowed the appearance of Assad in the sky and his casting out upon the Earth. MORE Confirmation that the Tiangong Space Station Crash Represented Assad Sitting in the Temple of GOD in Heaven, and then Being Thrown Down Onto The Earth! I recently reported that "Tiangong" means "Heavenly Place". However, now I am understanding that it means "Heavenly Palace", "Heavenly Temple", 'Altar of Heaven" and "LORD/King of Heaven". These first 2 links will show that Tiangong means "Heavenly Palace", which is another way of saying "Heaven's Temple". Then, the links after these will show more proof of "Heaven's temple and Heaven's altar" and even the name of the Chinese trinity and Chinese creator. The location of the "Tiangong Temple" in Taiwan was originally the location of Taiwan's "Temple of Heaven". The temple worships a demon named Tiangong. Both the temple and the deity shares this name. All of this also reveals that even the Chinese will worship Assad. The bible declares that the majority of the world, and people of all nations will worship him. It also confirms again that the trinity is an evil, (click for proof) pagan doctrine. We have ONLY ONE CREATOR.